High-frequency trading (HFT) is a primary form of algorithmic trading in finance. Specifically, it is the use of sophisticated technological tools and computer algorithms to rapidly trade securities. HFT uses proprietary trading strategies carried out by computers to move in and out of positions in seconds or fractions of a second. It is estimated that as of 2009, HFT accounted for 60-73% of all US equity trading volume, with that number falling to approximately 50% in 2012. High-frequency traders move in and out of short-term positions at high volumes aiming to capture sometimes a fraction of a cent in profit on every trade. HFT firms do not consume significant amounts of capital, accumulate positions or hold their portfolios overnight. As a result, HFT has a potential Sharpe ratio (a measure of reward to risk) tens of times higher than traditional buy-and-hold strategies. High-frequency traders typically compete against other HFTs, rather than long-term investors. HFT firms make up the low margins with incredibly high volumes of trades, frequently numbering in the millions. It has been argued that a core incentive in much of the technological development behind high-frequency trading is essentially front running, in which the varying delays in the propagation of orders is taken advantage of by those who have earlier access to information. A substantial body of research argues that HFT and electronic trading pose new types of challenges to the financial system. Algorithmic and high-frequency traders were both found to have contributed to volatility in the Flash Crash of May 6, 2010, when high-frequency liquidity providers rapidly withdrew from the market. Several European countries have proposed curtailing or banning HFT due to concerns about volatility. Other complaints against HFT include the argument that some HFT firms scrape profits from investors when index funds rebalance their portfolios. High-frequency trading has taken place at least since 1999, after the U.S. Securities and Exchange Commission authorized electronic exchanges in 1998. At the turn of the 21st century, HFT trades had an execution time of several seconds, whereas by 2010 this had decreased to milli- and even microseconds. Until recently, high-frequency trading was a little-known topic outside the financial sector, with an article published by the New York Times in July 2009 being one of the first to bring the subject to the public's attention. On September 2, 2013, Italy became the world's first country to introduce a tax specifically targeted at HFT, charging a levy of 0.02% on equity transactions lasting less than 0.5 seconds. In the early 2000s, high-frequency trading still accounted for fewer than 10% of equity orders, but this proportion was soon to begin rapid growth. According to data from the NYSE, trading volume grew by about 164% between 2005 and 2009 for which high-frequency trading might be accounted. As of the first quarter in 2009, total assets under management for hedge funds with high-frequency trading strategies were $141 billion, down about 21% from their peak before the worst of the crises. The high-frequency strategy was first made successful by Renaissance Technologies. Many high-frequency firms are market makers and provide liquidity to the market which lowered volatility and helped narrow bid-offer spreads, making trading and investing cheaper for other market participants. In the United States in 2009, high-frequency trading firms represented 2% of the approximately 20,000 firms operating today, but accounted for 73% of all equity orders volume. The major U.S. high-frequency trading firms include Chicago Trading, Virtu Financial, Timber Hill, ATD, GETCO, Tradebot and Citadel LLC. The Bank of England estimates similar percentages for the 2010 US market share, also suggesting that in Europe HFT accounts for about 40% of equity orders volume and for Asia about 5-10%, with potential for rapid growth. By value, HFT was estimated in 2010 by consultancy Tabb Group to make up 56% of equity trades in the US and 38% in Europe. As HFT strategies become more widely used, it can be more difficult to deploy them profitably. According to an estimate from Frederi Viens of Purdue University, profits from HFT in the U.S. has been declining from an estimated peak of $5bn in 2009, to about $1.25bn in 2012. Though the percentage of volume attributed to HFT has fallen in the equity markets, it has remained prevalent in the futures markets. According to a study in 2010 by Aite Group, about a quarter of major global futures volume came from professional high-frequency traders. In 2012, according to a study by the TABB Group, HFT accounted for more than 60 percent of all futures market volume in 2012 on U.S. exchanges. High-frequency trading is quantitative trading that is characterized by short portfolio holding periods (see Wilmott, 2008). All portfolio-allocation decisions are made by computerized quantitative models. The success of high-frequency trading strategies is largely driven by their ability to simultaneously process large volumes of information, something ordinary human traders cannot do. Specific algorithms are closely guarded by their owners and are known as "algos". Many practical algorithms are in fact quite simple arbitrages which could previously have been performed at lower frequency—competition tends to occur through who can execute them the fastest rather than who can create new breakthrough algorithms. Some examples of standard arbitrages used in HFT are listed below. Market making is a set of high-frequency trading strategies that involve placing a limit order to sell (or offer) or a buy limit order (or bid) in order to earn the bid-ask spread. By doing so, market makers provide counterpart to incoming market orders. Although the role of market maker was traditionally fulfilled by specialist firms, this class of strategy is now implemented by a large range of investors, thanks to wide adoption of direct market access. As pointed out by empirical studies this renewed competition among liquidity providers causes reduced effective market spreads, and therefore reduced indirect costs for final investors. Some high-frequency trading firms use market making as their primary strategy. Automated Trading Desk, which was bought by Citigroup in July 2007, has been an active market maker, accounting for about 6% of total volume on both the NASDAQ and the New York Stock Exchange. Building up market making strategies typically involves precise modeling of the target market microstructure together with stochastic control techniques. These strategies appear intimately related to the entry of new electronic venues. Academic study of Chi-X's entry into the European equity market reveals that its launch coincided with a large HFT that made markets using both the incumbent market, NYSE-Euronext, and the new market, Chi-X. The study shows that the new market provided ideal conditions for HFT market-making, low fees (i.e., rebates for quotes that led to execution) and a fast system, yet the HFT was equally active in the incumbent market to offload nonzero positions. New market entry and HFT arrival are further shown to coincide with a significant improvement in liquidity supply. Much information happens to be unwittingly embedded in market data, such as quotes and volumes. By observing a flow of quotes, computers are capable of extracting information that has not yet crossed the news screens. Since all quote and volume information is public, such strategies are fully compliant with all the applicable laws. Filter trading is one of the more primitive high-frequency trading strategies that involves monitoring large amounts of stocks for significant or unusual price changes or volume activity. This includes trading on announcements, news, or other event criteria. Software would then generate a buy or sell order depending on the nature of the event being looked for. Tick trading often aims to recognize the beginnings of large orders being placed in the market. For example, a large order from a pension fund to buy will take place over several hours or even days, and will cause a rise in price due to increased demand. An arbitreur can try to spot this happening then buy up the security, then profit from selling back to the pension fund. This strategy has become more difficult since the introduction of dedicated trade execution companies in the 2000s which provide optimal trading for pension and other funds, specifically designed to remove the arbitrage opportunity. Certain recurring events generate predictable short-term responses in a selected set of securities. [vague] High-frequency traders take advantage of such predictability to generate short-term profits. Another set of high-frequency trading strategies are strategies that exploit predictable temporary deviations from stable statistical relationships among securities. Statistical arbitrage at high frequencies is actively used in all liquid securities, including equities, bonds, futures, foreign exchange, etc. Such strategies may also involve classical arbitrage strategies, such as covered interest rate parity in the foreign exchange market, which gives a relationship between the prices of a domestic bond, a bond denominated in a foreign currency, the spot price of the currency, and the price of a forward contract on the currency. High-frequency trading allows similar arbitrages using models of greater complexity involving many more than four securities. The TABB Group estimates that annual aggregate profits of high-frequency arbitrage strategies exceeded US$21 billion in 2009, although the Purdue study estimates the profits for all high frequency trading were US$5 billion in 2009. Company news in electronic text format is available from many sources including commercial providers like Bloomberg, public news websites, and Twitter feeds. Automated systems can identify company names, keywords and sometimes semantics to trade news before human traders can process it. A separate, "naïve" class of high-frequency trading strategies relies exclusively on ultra-low latency direct market access technology. In these strategies, computer scientists rely on speed to gain minuscule advantages in arbitraging price discrepancies in some particular security trading simultaneously on disparate markets. Another aspect of low latency strategy has been the switch from fiber optic to microwave technology for long distance networking. Especially since 2011, there has been a trend to use microwaves to transmit data across key connections such as the one between New York and Chicago. This is because microwaves travelling in air suffer a less than 1% speed reduction compared to light travelling in a vacuum, whereas with conventional fiber optics light travels over 30% slower. High-frequency trading strategies may use properties derived from market data feeds to identify orders that are posted at sub-optimal prices. Such orders may offer a profit to their counterparties that high-frequency traders can try to obtain. Examples of these features include the age of an order  or the sizes of displayed orders. Tracking important order properties may also allow trading strategies to have a more accurate prediction of the future price of a security. The effects of algorithmic and high-frequency trading are the subject of ongoing research. Regulators claim these practices contributed to volatility in the May 6, 2010 Flash Crash and find that risk controls are much less stringent for faster trades. Members of the financial industry generally claim high-frequency trading substantially improves market liquidity, narrows bid-offer spread, lowers volatility and makes trading and investing cheaper for other market participants. In September 2011, market data vendor Nanex LLC published a report stating the contrary. They looked at the amount of quote traffic compared to the value of trade transactions over 4 and half years and saw a 10-fold decrease in efficiency. Nanex's owner is an outspoken detractor of high-frequency trading. Many discussions about HFT focus solely on the frequency aspect of the algorithms and not on their decision-making logic (which is typically kept secret by the companies that develop them). This makes it difficult for observers to pre-identify market scenarios where HFT will dampen or amplify price fluctuations. The growing quote traffic compared to trade value could indicate that more firms are trying to profit from cross-market arbitrage techniques that do not add significant value through increased liquidity when measured globally. More fully automated markets such as NASDAQ, Direct Edge, and BATS, in the US, gained market share from less automated markets such as the NYSE. Economies of scale in electronic trading contributed to lowering commissions and trade processing fees, and contributed to international mergers and consolidation of financial exchanges. The speeds of computer connections, measured in milliseconds or microseconds, have become important. Competition is developing among exchanges for the fastest processing times for completing trades. For example, in 2009 the London Stock Exchange bought a technology firm called MillenniumIT and announced plans to implement its Millennium Exchange platform which they claim has an average latency of 126 microseconds. Spending on computers and software in the financial industry increased to $26.4 billion in 2005. Most retirement savings, such as private pension funds or 401(k) and individual retirement accounts in the US, are invested in mutual funds, the most popular of which are index funds which must periodically "rebalance" or adjust their portfolio to match the new prices and market capitalization of the underlying securities in the stock or other index that they track. This allows algorithmic traders (80% of the trades of whom involve the top 20% most popular securities) to anticipate and trade ahead of stock price movements caused by mutual fund rebalancing, making a profit on advance knowledge of the large institutional block orders. This results in profits transferred from investors to algorithmic traders, estimated to be at least 21 to 28 basis points annually for S&P 500 index funds, and at least 38 to 77 basis points per year for Russell 2000 funds. John Montgomery of Bridgeway Capital Management says that the resulting "poor investor returns" from trading ahead of mutual funds is "the elephant in the room" that "shockingly, people are not talking about." The brief but dramatic stock market crash of May 6, 2010 was initially thought to have been caused by high-frequency trading. The Dow Jones Industrial Average plunged to its largest intraday point loss, but not percentage loss, in history, only to recover much of those losses within minutes. In the aftermath of the crash, several organizations argued that high-frequency trading was not to blame, and may even have been a major factor in minimizing and partially reversing the Flash Crash. CME Group, a large futures exchange, stated that, insofar as stock index futures traded on CME Group were concerned, its investigation had found no support for the notion that high-frequency trading was related to the crash, and actually stated it had a market stabilizing effect. However, after almost five months of investigations, the U.S. Securities and Exchange Commission (SEC) and the Commodity Futures Trading Commission (CFTC) issued a joint report identifying the cause that set off the sequence of events leading to the Flash Crash and concluding that the actions of high-frequency trading firms contributed to volatility during the crash. The report found that the cause was a single sale of $4.1 billion in futures contracts by a mutual fund, identified as Waddell & Reed Financial, in an aggressive attempt to hedge its investment position. The joint report also found that "high-frequency traders quickly magnified the impact of the mutual fund's selling." The joint report "portrayed a market so fragmented and fragile that a single large trade could send stocks into a sudden spiral," that a large mutual fund firm "chose to sell a big number of futures contracts using a computer program that essentially ended up wiping out available buyers in the market," that as a result high-frequency firms "were also aggressively selling the E-mini contracts," contributing to rapid price declines. The joint report also noted "'HFTs began to quickly buy and then resell contracts to each other — generating a 'hot-potato' volume effect as the same positions were passed rapidly back and forth.'" The combined sales by Waddell and high-frequency firms quickly drove "the E-mini price down 3% in just four minutes." As prices in the futures market fell, there was a spillover into the equities markets where "the liquidity in the market evaporated because the automated systems used by most firms to keep pace with the market paused" and scaled back their trading or withdrew from the markets altogether. The joint report then noted that "Automatic computerized traders on the stock market shut down as they detected the sharp rise in buying and selling." As computerized high-frequency traders exited the stock market, the resulting lack of liquidity "...caused shares of some prominent companies like Procter & Gamble and Accenture to trade down as low as a penny or as high as $100,000." While some firms exited the market, high-frequency firms that remained in the market exacerbated price declines because they "'escalated their aggressive selling' during the downdraft." In the years following the flash crash, academic researchers and experts from the CFTC pointed to high-frequency trading as just one component of the complex current U.S. market structure that led to the events of May 6, 2010. In 2015 the Paris-based regulator of the 28-nation European Union, the European Securities and Markets Authority, proposed time standards to span the EU, that would more accurately synchronize trading clocks "to within a nanosecond, or one-billionth of a second" to refine regulation of gateway-to-gateway latency time— "the speed at which trading venues acknowledge an order after receiving a trade request." Using these more detailed time-stamps, regulators would be better able to distinguish the order in which trade requests are received and executed, to identify market abuse and prevent potential manipulation of European securities markets by traders using advanced, powerful, fast computers and networks. The fastest technologies give traders an advantage over other "slower" investors as they can change prices of the securities they trade. Various studies reported that high-frequency trading reduces volatility and does not pose a systemic risk, and lowers transaction costs for retail investors, without impacting long term investors. However, high-frequency trading has been the subject of intense public focus and debate since the May 6, 2010 Flash Crash. At least one Nobel Prize–winning economist, Michael Spence, believes that HFT should be banned. A working paper found "the presence of high frequency trading has significantly mitigated the frequency and severity of end-of-day price dislocation". In their joint report on the 2010 Flash Crash, the SEC and the CFTC stated that "market makers and other liquidity providers widened their quote spreads, others reduced offered liquidity, and a significant number withdrew completely from the markets" during the flash crash. Politicians, regulators, scholars, journalists and market participants have all raised concerns on both sides of the Atlantic. and this has led to discussion of whether high-frequency market makers should be subject to various kinds of regulations. In a September 22, 2010 speech, SEC chairperson Mary Schapiro signaled that US authorities were considering the introduction of regulations targeted at HFT. She said, "high frequency trading firms have a tremendous capacity to affect the stability and integrity of the equity markets. Currently, however, high frequency trading firms are subject to very little in the way of obligations either to protect that stability by promoting reasonable price continuity in tough times, or to refrain from exacerbating price volatility." She proposed regulation that would require high-frequency traders to stay active in volatile markets. Current SEC chair Mary Jo White pushed back against claims that high-frequency traders have an inherent benefit in the markets. SEC associate director Gregg Berman suggested that the current debate over HFT lacks perspective. In an April 2014 speech, Berman argued: "It's much more than just the automation of quotes and cancels, in spite of the seemingly exclusive fixation on this topic by much of the media and various outspoken market pundits. (...) I worry that it may be too narrowly focused and myopic." risk controls were poorer in high-frequency trading, because of competitive time pressure to execute trades without the more extensive safety checks normally used in slower trades. "some firms do not have stringent processes for the development, testing, and deployment of code used in their trading algorithms." "out-of control algorithms were more common than anticipated prior to the study and that there were no clear patterns as to their cause." Promoting robust internal risk management procedures and controls over the algorithms and strategies employed by HFT firms. Trading venues should disclose their fee structure to all market participants. Regulators should address market manipulation and other threats to the integrity of markets, regardless of the underlying mechanism, and not try to intervene in the trading process or to restrict certain types of trading activities. Another area of concern relates to flash trading. Flash trading is a form of trading in which certain market participants are allowed to see incoming orders to buy or sell securities very slightly earlier than the general market participants, typically 30 milliseconds, in exchange for a fee. This feature was introduced to allow participants like market makers the opportunity to meet or improve on the national best bid and offer price to ensure incoming orders were matched at the most advantageous prices according to Regulation NMS. According to some sources, the programs can inspect major orders as they come in and use that information to profit. Currently, the majority of exchanges do not offer flash trading, or have discontinued it. By March 2011, the NASDAQ, BATS, and Direct Exchange exchanges had all ceased offering its Competition for Price Improvement functionality (widely referred to as "flash technology/trading"). On September 24, 2013, it was revealed that some traders are under investigation for possible news leak and insider trading. Right after the Federal Reserve announced its newest decision, trades were registered in the Chicago futures market within two milliseconds. However, the news was released to the public in Washington D.C. at exactly 2:00 pm calibrated by atomic clock, and takes seven milliseconds to reach Chicago at the speed of light. Contrary to claims by high-frequency trader Virtu Financial, anything faster is not physically possible. It was concluded the high-speed traders in question had to receive the news under embargo from proprietary feed servers in Chicago that were pre-loaded with the Fed's announcement. In March 2012, regulators fined Octeg LLC, the equities market-making unit of high-frequency trading firm Getco LLC, for $450,000. Octeg violated Nasdaq rules and failed to maintain proper supervision over its stock trading activities. The fine resulted from a request by Nasdaq OMX for regulators to investigate the activity at Octeg LLC from the day after the May 6, 2010 Flash Crash through the following December. Nasdaq determined the Getco subsidiary lacked reasonable oversight of its algo-driven high-frequency trading. In October 2013, regulators fined Knight Capital $12 million for the trading malfunction that led to its collapse. Knight was found to have violated the SEC's market access rule, in effect since 2010 to prevent such mistakes. Regulators stated the HFT firm ignored dozens of error messages before its computers sent millions of unintended orders to the market. Knight Capital eventually merged with Getco to form KCG Holdings. Knight lost over $460 million from its trading errors in August 2012 that caused disturbance in the U.S. stock market. In September 2014, HFT firm Latour Trading LLC agreed to pay a SEC penalty of $16 million. Latour is a subsidiary of New York-based high-frequency trader Tower Capital LLC. According to the SEC's order, for at least two years Latour underestimated the amount of risk it was taking on with its trading activities. By using faulty calculations, Latour managed to buy and sell stocks without holding enough capital. At times, the Tower Capital subsidiary accounted for 9% of all U.S. stock trading. The SEC noted the case is the largest penalty for a violation of the net capital rule. On January 12, 2015, the SEC announced a $14 million penalty against a subsidiary of BATS Global Markets, an exchange operator that was founded by high-frequency traders. The BATS subsidiary Direct Edge failed to properly disclose order types on its two exchanges EDGA and EDGX. These exchanges offered three variations of controversial "Hide Not Slide" orders and failed to accurately describe their priority to other orders. The SEC found the exchanges disclosed complete and accurate information about the order types "only to some members, including certain high-frequency trading firms that provided input about how the orders would operate." Reported in January 2015, UBS agreed to pay $14.4 million to settle charges of not disclosing an order type that allowed high-frequency traders to jump ahead of other participants. The SEC stated that UBS failed to properly disclose to all subscribers of its dark pool "the existence of an order type that it pitched almost exclusively to market makers and high-frequency trading firms." UBS broke the law by accepting and ranking hundreds of millions of orders priced in increments of less than one cent, which is prohibited under Regulation NMS. The order type called PrimaryPegPlus enabled HFT firms "to place sub-penny-priced orders that jumped ahead of other orders submitted at legal, whole-penny prices." In June 2014, high-frequency trading firm Citadel LLC was fined $800,000 for violations that included quote stuffing. Nasdaq's disciplinary action stated that Citadel "failed to prevent the strategy from sending millions of orders to the exchanges with few or no executions." It was pointed out that Citadel "sent multiple, periodic bursts of order messages, at 10,000 orders per second, to the exchanges. This excessive messaging activity, which involved hundreds of thousands of orders for more than 19 million shares, occurred two to three times per day." In July 2013, it was reported that Panther Energy Trading LLC was ordered to pay $4.5 million to U.S. and U.K. regulators on charges that the firm's high-frequency trading activities manipulated commodity markets. Panther's computer algorithms placed and quickly canceled bids and offers in futures contracts including oil, metals, interest rates and foreign currencies, the U.S. Commodity Futures Trading Commission said. In October 2014, Panther's sole owner Michael Coscia was charged with six counts of commodities fraud and six counts of "spoofing". The indictment stated that Coscia devised a high-frequency trading strategy to create a false impression of the available liquidity in the market, "and to fraudulently induce other market participants to react to the deceptive market information he created". In October 2014, Athena Capital Research LLC was fined $1 million on price manipulation charges. The high-speed trading firm used $40 million to rig prices of thousands of stocks, including eBay Inc, according to U.S. regulators. The HFT firm Athena manipulated closing prices commonly used to track stock performance with "high-powered computers, complex algorithms and rapid-fire trades," the SEC said. The regulatory action is one of the first market manipulation cases against a firm engaged in high-frequency trading. Reporting by Bloomberg noted the HFT industry is "besieged by accusations that it cheats slower investors." Advanced computerized trading platforms and market gateways are becoming standard tools of most types of traders, including high-frequency traders. Broker-dealers now compete on routing order flow directly, in the fastest and most efficient manner, to the line handler where it undergoes a strict set of risk filters before hitting the execution venue(s). Ultra-low latency direct market access (ULLDMA) is a hot topic amongst brokers and technology vendors such as Goldman Sachs, Credit Suisse, and UBS. Typically, ULLDMA systems can currently handle high amounts of volume and boast round-trip order execution speeds (from hitting "transmit order" to receiving an acknowledgment) of 10 milliseconds or less. Such performance is achieved with the use of hardware acceleration or even full-hardware processing of incoming market data, in association with high-speed communication protocols, such as 10 Gigabit Ethernet or PCI Express. More specifically, some companies provide full-hardware appliances based on FPGA technology to obtain sub-microsecond end-to-end market data processing. Buy side traders made efforts to curb predatory HFT strategies. Brad Katsuyama, co-founder of the IEX, led a team that implemented THOR, a securities order-management system that splits large orders into smaller sub-orders that arrive at the same time to all the exchanges through the use of intentional delays. This largely prevents information leakage in the propagation of orders that high-speed traders can take advantage of. ^ a b c Irene Aldridge (July 8, 2010). "What is High Frequency Trading, After All?". Huffington Post. Retrieved August 15, 2010. ^ a b c d e f g "Trade Worx / SEC letters" (PDF). April 21, 2010. Retrieved September 10, 2010. ^ Aldridge, Irene (July 26, 2010). 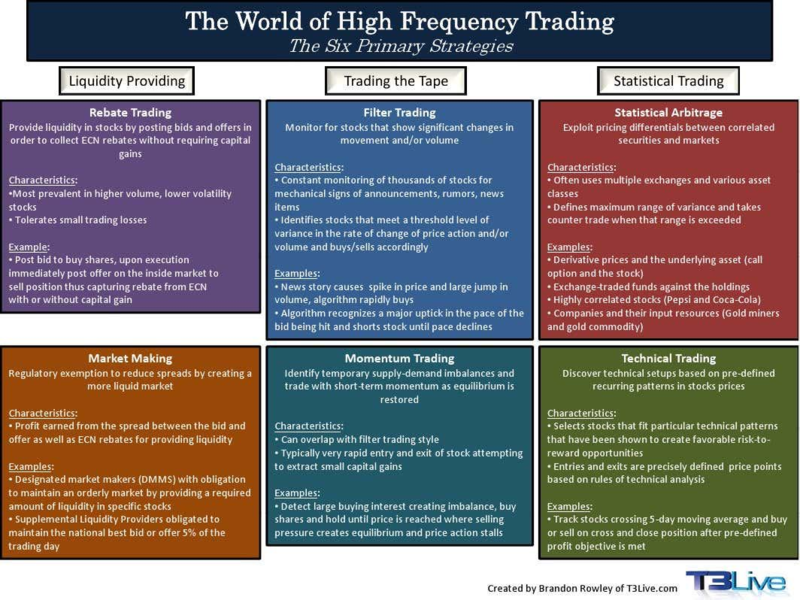 "How profitable is high frequency trading". Huffington Post. ^ Mamudi, Sam (May 3, 2013). "Charlie Munger: HFT is Legalized Front-Running". Barron's Stocks To Watch. Retrieved February 14, 2015. ^ Kroft, Steve (March 30, 2014). "Is the U.S. stock market rigged?". CBS News. Retrieved November 2, 2014. ^ a b c d e f g h Lauricella, Tom (October 2, 2010). "How a Trading Algorithm Went Awry". The Wall Street Journal. ^ Huw Jones (July 7, 2011). "Ultra fast trading needs curbs -global regulators". Reuters. Retrieved July 12, 2011. ^ Ross, Alice K; Will Fitzgibbon; Nick Mathiason (16 September 2012). "Britain opposes MEPs seeking ban on high-frequency trading. UK fighting efforts to curb high-risk, volatile system, with industry lobby dominating advice given to Treasury". The Guardian. Retrieved 2 January 2015. ^ a b Amery, Paul (November 11, 2010). "Know Your Enemy". IndexUniverse.eu. Retrieved 26 March 2013. ^ a b Petajisto, Antti (2011). "The index premium and its hidden cost for index funds" (PDF). Journal of Empirical Finance 18: 271–288. doi:10.1016/j.jempﬁn.2010.10.002. Retrieved 26 March 2013. ^ a b Rekenthaler, John (February–March 2011). "The Weighting Game, and Other Puzzles of Indexing" (PDF). Morningstar Advisor. pp. 52–56. Retrieved 26 March 2013. ^ a b CHARLES DUHIGG (July 23, 2009). "Stock Traders Find Speed Pays, in Milliseconds". New York Times. Retrieved Sep 10, 2010. ^ AFP, Reuters (2013-09-02). "Italy first to slap tax on high speed stock trading". Deutsche Welle. Retrieved 2013-09-03. ^ Philip Stafford (2013-09-01). "Italy introduces tax on high-speed trade and equity derivatives". The Financial Times. Retrieved 2013-09-03. (registration required (help)). ^ James E. Hollis (Sep 2013). "HFT: Boon? Or Impending Disaster?" (PDF). Cutter Associates. Retrieved July 1, 2014. ^ a b Jeremy Grant (Sep 2, 2010). "High-frequency trading: Up against a bandsaw". Financial Times. Retrieved Sep 10, 2010. ^ a b c Clive Cookson (May 12, 2013). "Time is money when it comes to microwaves". Financial Times. Retrieved May 12, 2013. ^ Polansek, Tom (23 August 2013). "CFTC finalizes plan to boost oversight of fast traders: official". Reuters. Retrieved 8 July 2014. ^ a b c d e f Hendershott, Terrence; Jones, Charles M.; Menkveldf, Albert J. (February 2011). "Does Algorithmic Trading Improve Liquidity?" (PDF). Journal of Finance LXVI (1). Retrieved January 30, 2015. ^ Bozdog, Dragos. "Rare Events Analysis of High-Frequency Equity Data". Wilmott Journal, pp. 74-81, 2011. Retrieved 20 November 2013. ^ a b Mehta, Nina (1 Oct 2010). "Automatic Futures Trade Drove May Stock Crash, Report Says". Bloomberg. ^ a b c d Bowley, Graham (1 Oct 2010). "Lone $4.1 Billion Sale Led to ‘Flash Crash’ in May". The New York Times. ^ a b Spicer, Jonathan (1 Oct 2010). "Single U.S. trade helped spark May's flash crash". Reuters. ^ a b Goldfarb, Zachary (1 Oct 2010). "Report examines May's 'flash crash,' expresses concern over high-speed trading". Washington Post. ^ a b Spicer, Jonathan (15 Oct 2010). "Special report: Globally, the flash crash is no flash in the pan". Reuters. ^ "Nanex's Hunsader Seeks To 'Save' Markets From High-Frequency Trading". Forbes. 6 February 2014. Retrieved 11 July 2014. ^ "London Stock Exchange Group to acquire MillenniumIT for US$30m (£18m)" (Press release). The London Stock Exchange. 2009-09-16. ^ "Turquoise confirms it is the world's fastest trading platform" (PDF) (Press release). Turquoise. 2010-10-20. ^ a b "High-Frequency Firms Tripled Trades in Stock Rout, Wedbush Says". Bloomberg/Financial Advisor. August 12, 2011. Retrieved 26 March 2013. ^ Siedle, Ted (March 25, 2013). "Americans Want More Social Security, Not Less". Forbes. Retrieved 26 March 2013. ^ Salmon, Felix (July 18, 2012). "What’s driving the Total Return ETF?". Reuters. Retrieved 26 March 2013. ^ Braithwaite, Tom (2010-05-07). "Watchdogs under pressure on market swings". Financial Times. Retrieved 2010-05-08. ^ Browning, E.S. (2007-10-15). "Exorcising Ghosts of Octobers Past". The Wall Street Journal (Dow Jones & Company). pp. C1–C2. Retrieved 2007-10-15. ^ a b "What happened on May 6th?". CME Group. 2010-05-18. ^ a b "Findings Regarding the Market Events of May 6, 2010" (PDF). 2010-09-30. ^ Scannell, Kara (2010-10-01). "Report: Algorithm Set Off 'Flash Crash' Amid Stressed Market". The Wall Street Journal. Retrieved 2010-10-01. ^ Pritzke, Marc (2010-05-17). "Die Spur führt nach Kansas". Der Spiegel (in German). Retrieved 2010-10-01. ^ Popper, Nathaniel (1 Oct 2010). "$4.1-billion trade set off Wall Street 'flash crash,' report finds". Los Angeles Times. ^ Younglai, Rachelle (5 Oct 2010). "U.S. probes computer algorithms after "flash crash"". Reuters. ^ a b Gillian Tett (Sep 9, 2010). "What can be done to slow high-frequency trading?". Financial Times. Retrieved Sep 10, 2010. ^ Bart Chilton (Sep 6, 2010). "Rein in the cyber cowboys". Financial Times. Retrieved Sep 10, 2010. ^ Chairman Mary Schapiro U.S. Securities and Exchange Commission (September 22, 2010). "Remarks Before the Security Traders Association". ^ Jesse Westbrook (Oct 19, 2010). "NYSE's Niederauer Expects More Firms to Face Expanded Market-Maker Rules". Bloomberg. ^ Bartash, Jeffry (April 29, 2014). "U.S. markets 'not rigged,' SEC boss says, White downplays 'flash boy' charges in new Michael Lewis book". MarketWatch. Dow Jones. Retrieved July 2, 2014. ^ Murray, Timothy (April 16, 2014). "SEC’s Berman: The Data Disputes HFT Narrative". WatersTechnology. waterstechnology.com. Retrieved July 2, 2014. ^ Ellen Brown (April 23, 2010). "Computerized Front-Running". CounterPunch. Retrieved May 8, 2010. ^ The Wall Street Journal (February 25, 2011). "Direct Edge to Stop 'Flashing' Orders on Monday". ^ Javers, Eamon (24 September 2013). "News organizations respond to Fed lockup questions". CNBC. Retrieved 25 September 2013. ^ Irwin, Neil (24 September 2013). "Traders may have gotten last week’s Fed news 7 milliseconds early". Washington Post. Retrieved 25 September 2013. ^ "Shredding Virtu's Response with Science". Nanex. September 28, 2013. Retrieved February 14, 2015. ^ Mehta, Nina (March 22, 2012). "Getco Fined $450,000 for Failing to Supervise Equity Trading". Bloomberg. ^ Grant, Justin (March 26, 2012). "Getco Slapped With $450k Fine For Weak HFT Oversight". Wall Street & Technology. ^ Mamudi, Sam (October 16, 2013). "Knight Capital Agrees to $12 Million Settlement for 2012 Errors". Bloomberg. ^ Patterson, Scott (September 17, 2014). "High-Frequency Trading Firm Latour to Pay $16 Million SEC Penalty". The Wall Street Journal. ^ Levine, Matt (January 12, 2015). "'Hide Not Slide' Orders Were Slippery and Hidden". Bloomberg View. ^ "SEC Charges Direct Edge Exchanges With Failing to Properly Describe Order Types". U.S. Securities and Exchange Commission. January 12, 2015. ^ "SEC Charges UBS Subsidiary With Disclosure Violations and Other Regulatory Failures in Operating Dark Pool". U.S. Securities and Exchange Commission. January 15, 2015. ^ McCrank, John (5 August 2014). "Citadel fined $800,000 by U.S. regulators for trading violations". Reuters. Retrieved 22 April 2015. ^ Fortado, Lindsay; Brush, Silla (July 22, 2013). "Panther, Coscia Fined Over High-Frequency Trading Algorithms". Bloomberg. ^ "High-Frequency Trader Indicted for Manipulating Commodities Futures Markets in First Federal Prosecution for Spoofing". Federal Bureau of Investigation. October 2, 2014. ^ Geiger, Keri; Mamudi, Sam (October 16, 2014). "HFT Firm Fined $1 Million for Manipulating Nasdaq". Bloomberg. ^ "The Wolf Hunters of Wall Street". New York Times.